Section Division-II Track and Field Championship. 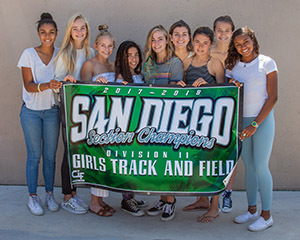 Girls' school records set this season for for 100 hurdles, 100-meters,1600 meters, long jump, shot put, discus throw, 2-mile run, cross country, distance medley relay, 4x100 relay. Alysha Hickey wins state Long Jump and places 4th in State High Jump. Much More. The 2018 Track Results can be viewed on Athletic.net. For other years, change the Date above the meet list. Our track is only 354 meters around. Here is a map of the starts and finish lines. San Diego Track Magazine for full section coverage. The Islander Sports Foundation charges each sport $60 for overhead. However, that doesn't cover our specific costs. Click on the link above to make your donation. We need to raise over $3,400 to cover the amout they'll deduct from our booster account. If you will be new to the team, please fill-out the information form linked below. We communicate with athletes and parents based on this information. Also, I'll let you know about current training. Text or email me using the contact info in the left sidebar for upcoming training. The schedule below show the meets we normally attend, although not every one, each year. We go to all the league meets (orange background). The meets with a yellow background are not CIF sanctioned meets. 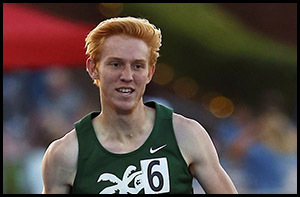 The Triton Invite is an Open/College Invite that a lot of High School kids attend. The ones with the green background are Invites that we usually go to. Most of the invites require a mark to enter or are restricted by number of entrants. The Invites shown are ones we'll certainly attend, others are possible. Many more archival photos and seasonal pages to follow... keep checking back. There are only two true sports: Track and Cross Country. All the rest are just games.